Available on Steam as Early Access! Drunk On Nectar is a Nature Sandbox game about animals, plants and ecology. Experience life as the remarkable creatures of the natural world! Their lives are beyond our wildest dreams! Choose any creature you fancy; be it invertebrate, reptile, bird or mammal and experience their remarkable lives in the resplendent natural world. Plants and animals not mere visual props in DoN, but living entities that grow in real-time from a seed to sapling, or from a chrysalis to a beautiful butterfly. DoN's world is built to invertebrate scale! You are literally a tiny speck on the floor dwarfed by a mighty ever-changing world above. Every leaf, stalk and blade of grass has an independent lifecycle in Drunk On Nectar. A full plant is a composite of many tiny micro-flora with randomized growth features for each plant. DoN's world itself is procedurally populated with flora, fauna and environmental features all configurable through a user controlled pre-game UI. Some fly, while others crawl, swim, slither, spin webs and some will even jump at you from afar to eat you! Every species in DoN has unique gameplay based on its morphology and traits providing many different ways to play the game and many fun combinations of matchups! 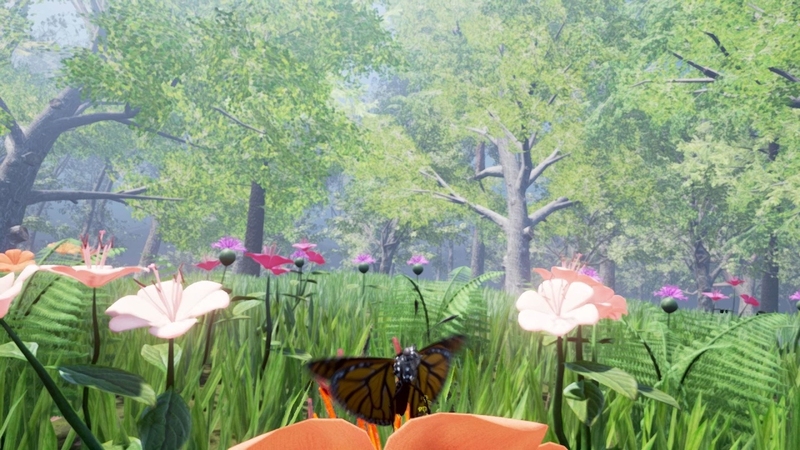 At the heart of this game lies Nature Simulation - a framework within which plants and animals undergo realistic lifecycle changes be it growth, reproduction, survival, propagation or dispersal. Players can manage, control, interact with, play as, tweak and design ecosystems of their own. Add new species and plants, change the flow of time and seasons and jump into your dream world to play as your favorite creature inside it! Check out DoN's channel if you want to see more videos! Are you going to implement bee vision? Or "Electric velcro"? Last edited by Bino; 02-09-2015, 06:11 PM. Thanks Bino. Loved watching that documentary, it's amazing how much of nature is beyond our perception. I feel nature as a gaming genre too is something that has been underutilized. That said I don't think I'm going for a bee vision post process material or electric velcro either Already have a tall list of features to build! A feature that I think may interest some of you in DoN (short for Drunk On Nectar) is its 3D Nav Mesh for aerial pathfinding. This game relies on aerial strategy and combat so units need to navigate a complex terrain (trees, various flora, landscape) while flying back and forth between their nests (eg:bee hives), flower beds for garden, safe havens, etc. I'll do a short Dev blog on it soon, but here's an image just to illustrate what I mean. Not sure if this is something people would like to see on the marketplace (after Epic allows code submissions). Been sick and bedridden for a while now, so the planned dev blog on DoN's aerial navmesh/pathfinding (depicted above) and all new updates have been postponed till I recover! I've been building a 'Living Flora System' for DoN. This allows plants in the game to exhibit natural lifecycles, i.e from birth as saplings onto flowering, pollination (player-driven), decay, seed formation, seed dispersal, etc. 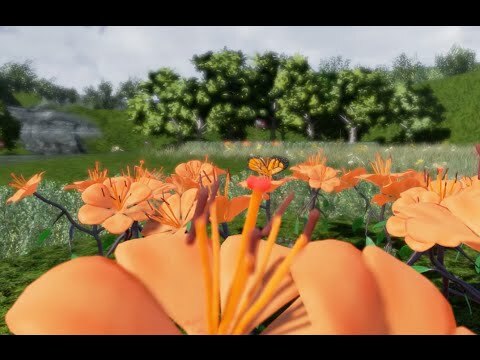 Here's a demo of the first phase - Orange Lilies in full bloom! Each plant actor contains generic 'flora components' which can contain any number of child flora inside and upto any level of nesting or complexity (eg: stalk/leaf/flower-bud/seed-pod). Each flora component has its own probability of birth at sub-flora level , individual growth rates for each plant, morph settings, wind settings, event callbacks tied to plant lifecycle states and so on. I recall loving that SimAnt game from all those years ago, which was great fun. Some of the most interesting things can be found in nature. I finally checked out SimAnt today, this is the second time someone referenced it. I love how the devs built a tongue-in-cheek encyclopedia into the game and effortlessly converted ant social structure into rad strategy gameplay! With an awesome engine like Unreal on our hands we should be able to push the nature genre even further. Your work is very interesting. Keep up the good work. Are you using morph targets for your floral system or some custom solution? Thanks for the encouragement! I'm indeed using morphs to grow plants, bloom flowers and pop leaves but this is done as part of a custom generic flora component which acts like a state machine. i.e. 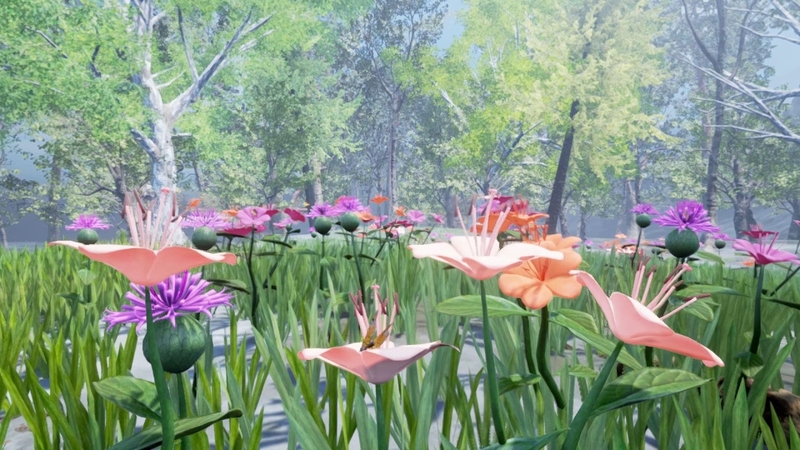 each flora goes through a number of states which can specify morph changes, transform changes (for procedural animations to scale/rotation) and material instance transformations (eg: wind weight is animated from an initial value for a sapling to a full value for grown plants or SSS color for a flower pod to blooming flower ). The idea is that if I quickly need to assemble a new species of plant I just need to prepare the artwork per usual (with optional morphs) and then setup a 'flora masterplan' which is basically a tree representation of a flora and all its children, describing the entire lifecycle of a plant. 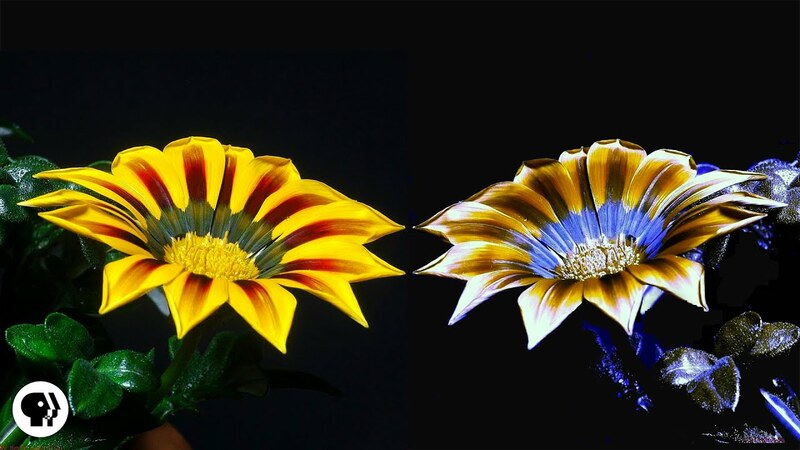 One nifty feature is a 'Trigger of life' pulse that each parent flora can send to its child flora telling it that it to wake up from dormancy meaning you can configure exactly when a new leaf shoots out from a parent stalk or during which stage of a plant's life the flower bud is supposed to be born. DoN uses a custom 3D aerial pathfinding solution for its Flying AI that I demonstrate in this video. 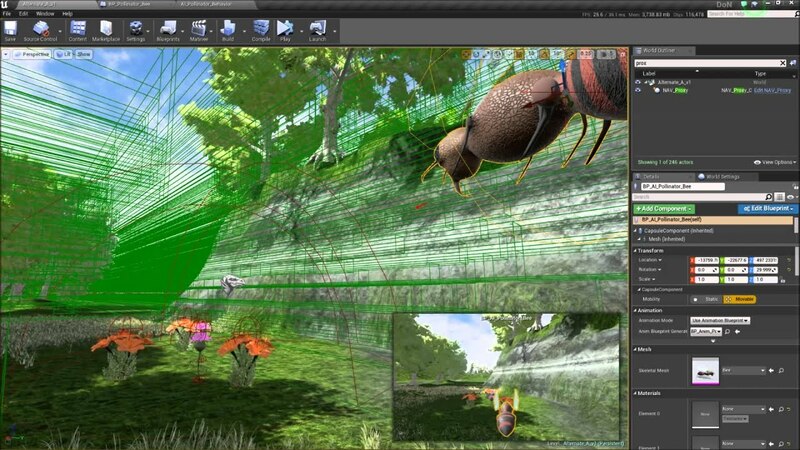 To achieve this, I wrote a custom 3D aerial/flying pathfinding solution for Unreal Engine in C++. One part of this solution that admittedly needs work is better decomposition of the navigation volumes across a map with complex obstacles. I'm working on a different NAV building algorithm for this and will post an update with a hopefully tighter decomposition (i.e. lesser number of volumes and a more visually pleasing spread of volumes across the map). For now, the system works well for my game and I haven't noticed any adverse performance implications either. Thanks SE_Jonf! The subject matter is unusual indeed, I'm just hoping with the right gameplay and mechanics I can convince people to give something totally different a shot. I started DoN with a different game enigne first, making the switch the Unreal was a no-brainer though when they made it open to the public last year. ps: fantastic work on your SciFi scenes, reminds me of Deus Ex! I might have picked them up if only SciFi wouldn't look so out of place in my brightly lit outdoors game!